Things were going badly long before the race had even begun. No sooner had I confirmed my entry and purchased my plane tickets than I was struck by injury, the cause of which is still unknown. A trapped nerve in my back in late June made merely walking for 24 yards a major challenge and I began to doubt that I would actually be able to compete at all. 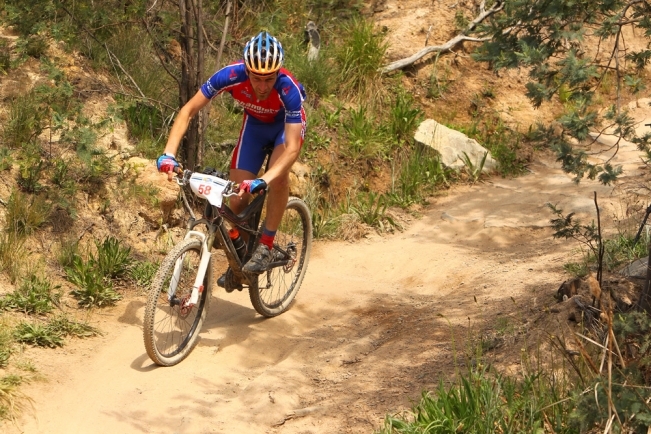 There followed 3 weeks of complete rest and 3 months off the mountain bike, far from ideal training. I think my swimming was the only thing to benefit during this time. The National Marathon Championships at Pippingford in mid-September at least confirmed that I could again ride a bike, albeit rather slowly. I thought things were going too smoothly as I flew to Sydney, the changes were perfect and my bike had made the journey successfully. However, normal service was soon resumed. I arrived at the depot to collect my camper van to discover that they had never heard of me, and neither had the depot they sent me to on the far side of the city. Much wrangling on the telephone and yet another taxi ride back across the city followed and two hours later I eventually had a van. After the second break-down I got stroppy and demanded a new one. Upon arrival at Mount Stromlo, overlooking Canberra, I was struck by how large the event village and pit area appeared to be, and how small the mountain itself looked. Over 30 minutes of climbing to the cross-over at the top revealed that this second impression was incorrect due to a number of false summits. The descents down Pork Barrell and Slick Rock were well worth the effort though. There was another, mostly fire-road, climb of about 6km back to the cross-over bridge at the summit, pass a herd (flock? pack?) of kangaroos followed by another fantastic descent, less technical, but much faster for the final 5km back to the arena, finishing on the 4X course just prior to the timing area and then back through the pits and out for another 20km lap. The briefing was conducted at Canberra Stadium, although a very impressive venue the reason behind this location remains a mystery. As well as the usual explanation of the rules and course markings we were warned about some of the local wildlife, a brown snake called The Brown Snake, a black snake called The Black Snake and a black snake with a red belly called The Red-bellied Black Snake. All three are dangerous and all three had been spotted on the course. Fortunately I didn't see any during the race, but Matt Page had a near-miss when the man in front of him ran one over. We were also warned about the local magpies. Many of the foreign riders laughed, but I had already been attacked twice while riding between Nowra and Kangaroo Valley. Although their claws had scraped harmlessly along the top of my helmet it is somewhat disconcerting to be attacked from above, especially if one doesn't see them coming. They are slightly larger than the British magpies and appear to have got the hang of diving out of the sun, Red-Barron style, invisible until the last minute. 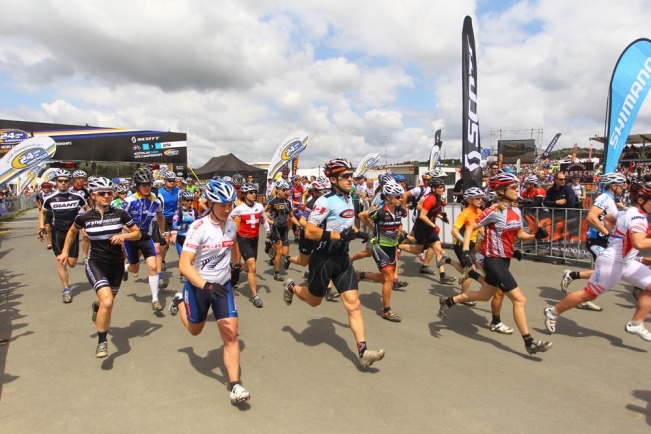 The start, in best 24hr tradition, was a Le Mans style running affair, the 101 Elite racers announced one by one and called up to take their places ahead of over 300 age-group racers, making this the largest gathering of solo 24hr riders ever assembled. Having not run at all since early June I was pleased to get a good start, probably around 25th - 30th as we headed out for the first lap which meant I avoided any bottlenecks further back. The first lap was dispatched in under an hour, and the second in not much more, the course really inspired the riders to hit everything flat out. It's almost a shame that the course demanded so much concentration as the views on the practice laps had been quite special, and it was a pity to miss them. However, taking one's eyes off the course was really not a good idea, it was tricky enough finding somewhere to drink. Almost every corner on the descents had either a large boulder or a precipice waiting to catch the unwary or over-confident. We had spent a considerable time on the Thursday practicing various lines through the tricky corners and it paid off, some reasonably consistent laps saw me in about 40th as darkness fell, and it was a very sudden darkness, the Aussies don't do twilight. 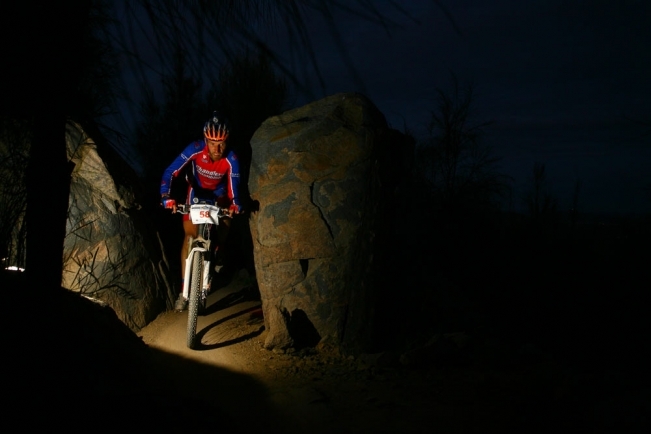 The night laps were all a bit of a blur, by about 10pm my brain had stopped functioning properly, which was unpleasantly like riding while being quite drunk, although the huge spiders on the track were unfortunately not hallucinations! One clear memory of the night is sitting in the pits with rice pudding dribbling down my chin, Simon impressing on me the importance of a granny ring with Carol pressing the painful bit of my back very hard indeed while Andy was practically force-feeding me a Mars bar. My forks gave up sometime around 2am and, being 12,229 miles from home, I had no spare bike and so carried on with them almost rigid. The climbs were a great relief as they allowed some feeling to return to my hands, which meant that I could actually feel the brake levers for the first section of the descents at least. I was seriously doubting not only my sanity but also my ability to continue through most of the early hours, it was really the guys in the pits who kept me going. Paul in particular can be quite scary when one has to return and confess to him that not all of the bottle had been drunk. Fortunately dawn arrived just as quickly as darkness had fallen, around 6:30am, the 11 hours of darkness was closer in duration to that of the Strathpuffer than to Newcastleton, luckily temperature-wise it was the other way around! It was just over 20 degrees during the daylight hours but felt warmer due to the dry air and never got below freezing despite the altitude and the darkness. Unwilling to attempt to take a large tub of white powder through customs and being unable to get hold of my preferred energy drink in Oz, I had committed the cardinal sin of trying something new in a race. My addled brain eventually made the connection that it was probably my new drink that was necessitating so many visits to the bushes, this resulted in me finishing the race on plain water. My second wind waited till about 8:30am to arrive, it appeared to cause some surprise in the pits when I came in just before 9am and announced that "if I can do 2 laps in under 1:30 I can get 3 more in", I'm not sure where that came from either. An xc-style new-bottle-only pit stop was indeed followed by a fast (for me) lap. By this stage the pain in my arms caused by the lack of any meaningful front suspension had just become complete numbness of everything below the elbow, and so I was able to ignore it. My left foot had now taken over duties as most painful body part. Somehow I pulled a second quick lap out of the bag and made it round before the cut-off, in time for one final lap. The feeling of crossing the finishing line with such large crowds cheering and the union flag waving is very hard to describe, and I was only 31st! I can't image what it must have been like for the new World Champions. My last 3 quick laps just as everyone else was starting to wind down and just focus on making it to the finish had somehow gained me 9 places, well worth the effort, even thought it meant walking and any form of coherent speech were a major challenge for the rest of the day. The size and scale of the race were like nothing I have ever seen and the course was up there with the best even Scotland can offer. It was the hardest thing I have ever done, but I'm so glad I did it, and for my first World Championships the result was much better than I could have hoped for. The whole trip itself was fantastic, the Blue Mountains, the kangaroos, the surfing, the climbing of Mount Wondabyne, parrots, lizards, beaches, aboriginal rock carvings, Tim-Tams, echidnas, tea and scones at the High Commissioner's residence and above all many, many new friends, just as Jamie Williamson's dad had promised. I would like to say a big thank you to all of the pit crew, most of whom I had never even met before, and also to the Cotic/Natterbox Team. Too many people to mention but you know who you are, I really couldn't have done it without you. 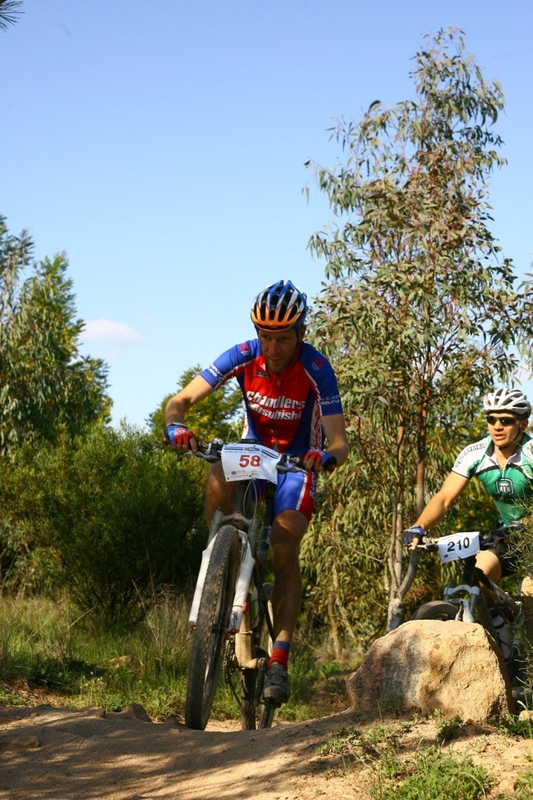 I will give a special mention though to Ben Forsyth and also for pre-race assistance and advice to Paul Traynor (stop by Berry Mountain Cycles if you are fortunate enough to be in the area).